We’re growing! And it shows. We’ve added four aircraft gates at Terminal 2-Humphrey to make way for expected growth in air service over the next five years. Construction of four new aircraft gates at Terminal 2-Humphrey is completed. The newly expanded gate area makes room for existing airlines to expand and for new airlines to enter the Minneapolis-St. Paul market. Currently, Condor, Icelandair, Jet Blue, Southwest and Sun Country Airlines operate at this terminal. 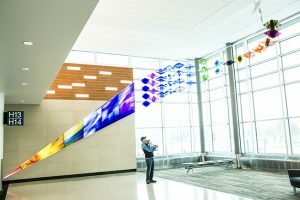 In addition to the new gates, the $27.5 million expansion project added amenities such as new restrooms, a nursing mother’s room, a lactation room and an indoor animal relief area, as well as the airport’s first green roof system. 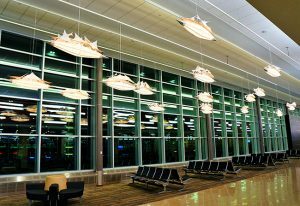 The new space is also designed to make the most efficient use of natural light during all seasons of the year and features long-lasting, sustainable materials, including terrazzo floors, which are also being installed in older portions of the terminal. Some fantastic commissioned art installations were also part of the project. Terminal 2 first opened its doors in May 2002 with 10 aircraft gates. Prior to this it was used mainly for charter flights. Take a peek inside the new addition.